According to folklore, the sun-bleached exoskeletons of round sea urchins found on the beach are actually a mermaid’s lost coins. (What? She didn’t have a pocket?) Due to this legend – and due to the fact that these artifacts resemble old Spanish silver coins – these “tests” were named Sand Dollars by beach combers. Wouldn’t it be great if these little pieces really WERE silver dollars? Well, now they are! New for 2019 comes this legal-tender silver dollar from the Republic of Palau that’s struck in the same size and appearance of an actual sand dollar. Minted by Coin Invest Trust (CIT) using its patented Smartminting© technology, each coin is a concave masterpiece crafted from a full ounce of highly-pure 99.9% fine silver. The coin’s reverse shows the unique five-stared petal-like pattern and the five perforation in the creature’s exoskeleton. The obverse features the Palau Coat of Arms along with the coin’s date, denomination and name. 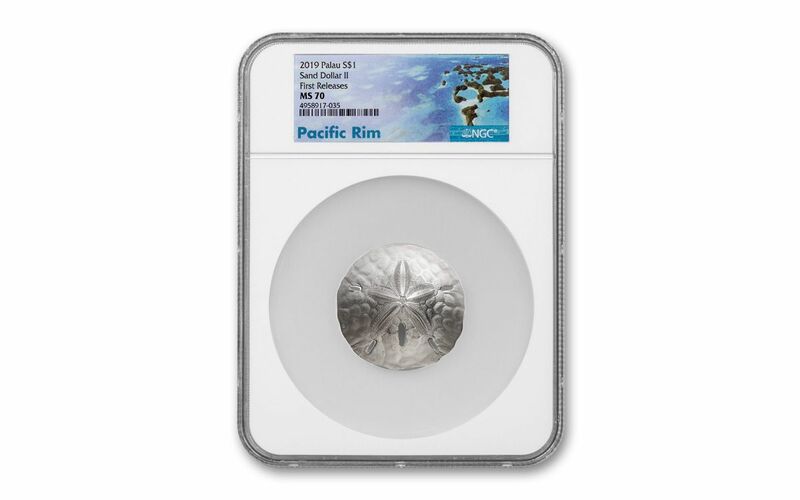 Your 2019 Palau $1 Sand Dollar Shaped One-Ounce Silver Coin has been graded by the Numismatic Guaranty Corporation (NGC) as being in flawless Mint State-70 (MS70) condition, a distinction that means your perfectly-graded coin will have ZERO imperfections – showing all features and fields exactly as the engraver and mint intended. It will come sonically sealed in an acrylic holder with an exclusive Pacific Rim label. In addition, each Sand Dollar coin also features a special satin, antique finish to enhance the detailed design. In addition, NGC has graded your Silver Sand Dollar to be a First Releases (FR) coin, a designation that means it was received by NGC or an NGC-approved depository within the first 30 days of its release. Collectors seek out these coins because they are produced with new dies and considered to have sharper strikes and deeper mirrors than those that are struck later. Also, the population of coins labeled First Releases is only a fraction of the total mintage. On the seabed, one can find as many as 600 sand dollars in one square yard – which means there are literally millions of these critters sprinkled just offshore from beaches everywhere across the temperate and tropical zones of both the Atlantic and Pacific Oceans. By comparison, only a fraction of these Silver Sand Dollar Coins exist in the world – just 2,019, in fact! Make sure you pocket one of these Silver Sand Dollar-Shaped One-Ounce Silver Coins before a tide of eager collectors sweep them all away! UNIQUE SAND DOLLAR-SHAPED COIN – The 2019 Palau Sand Dollar coin features incredible detail on the reverse that replicates the concave shape and appearance of a real sand dollar right down to the unique five-stared petal-like pattern and perforations. The obverse features the Palau Coat of Arms along with the coin’s date, denomination and name. SMARTMINTING© TECHNOLOGY – These coins were struck on behalf of Palau by Coin Invest Trust (CIT) using its patented Smartminting© technology to achieve the incredible detail featured on the reverse. STRUCK IN HIGHLY-PURE SILVER – Each 2019 Palau Sand Dollar Shaped Silver Coin is struck in a full ounce of highly-pure 99.9% silver. LEGAL TENDER COINAGE – These 2019 Palau Sand Dollar Shaped One-Ounce Silver Coins are $1 legal tender in the Republic of Palau, an island country in the western Pacific Ocean located between Guam and the Philippines. GRADED IN PERFECT UNCIRCULATED CONDITION – Your 2019 Palau $5 Sand Dollar Shaped One-Ounce Silver Coin has been graded by the Numismatic Guaranty Corporation (NGC) as being in flawless Mint State-70 (MS70) condition, a distinction that means your perfectly-graded coin will have ZERO imperfections – showing all features and fields exactly as the engraver and mint intended. 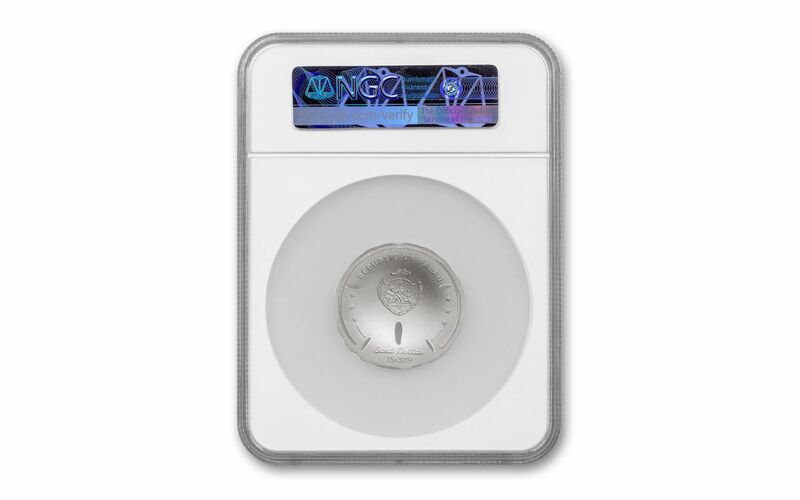 KEY FIRST RELEASES CERTIFICATION – NGC has graded your Silver Sand Dollar to be a First Releases (FR) coin, a designation that means your coin was received by NGC or an NGC-approved depository within the first 30 days of its release. It will come sonically sealed in an acrylic holder with an exclusive Pacific Rim label. ENHANCED ANTIQUED FINISH – Each Sand Dollar coin also features a special satin, antique finish to enhance the detailed design. LOW LIMITED EDITION – The worldwide limited edition for this unique sand dollar-shaped coin is just 2,019. This sand dollar really IS a silver dollar! Whether you’re a collector or a silver stacker, don’t miss your chance to get the 2019 Palau $1 Sand Dollar-Shaped One-Ounce Silver Coin today!